Incorporating sacred sites to your travels is a special way to connect with spirit, yourself and your traveling companions. 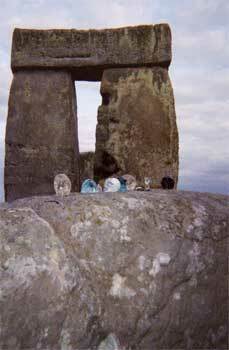 Sacred sites are everywhere; they can be churches, Indian sites and mounds, waterfalls and rivers, rock sites, crop circles, stone circles, encounters with animals or sacred individuals, and all kinds of ceremony sites, to name a few. In this section you will find various sacred sites and experiences that I have encountered in the past several years. It’s interesting to compare notes on what each person experienced at the sacred site (even if it’s with strangers who visit the site at the same time you do.) Children love sacred sites, the energy is usually outstanding. But occasionally sacred site energy can be too intense or not feel good to a person. Honor your feelings and other’s feelings about each site. I once had a “bad” experience on the Tor in Glastonbury, and I have a wonderful friend who will never visit Bath England again. But for the most part, sacred sites are a joy; they will center you, and connect you with spirit. Profound healing can occur by visiting a site that is sacred for you. I feel that way about Oahu, Hawaii and Bali. The memories of a site with which you have connected can bring you inner peace and centering at a moment’s invocation. Once you have a sacred encounter, you will never look at travel in the same way, or your life either. I hope you enjoy traveling along with me in my articles to various sacred sites and perhaps we will meet somewhere along the way of future journeys!